Today, as the last fiery streaks in the sky turn to purple over Big Lostman’s Bay, I realize how tired I am. I want to give up on navigating to the Indian shell mound campsite in the dark. We have already paddled nearly 20 miles today, and every paddle stroke has taught us the hard way that the tide is the life-blood of the Everglades: when and where it flows, you must flow. If it’s not flowing where you’re going, then you must wait. It will turn soon enough. I begin to construct possibilities in my head. If we stop here, we won’t be able to get the tent out because there is no high ground, and even the roots of the mangroves are inundated. The shell mound and a few small wooden platforms called chickees that come right up out of the water are the only dry places to spend the night in Everglades backcountry. Any chickee would be just as hard to find and a further paddle than the shell mound. I consider tying up to the mangroves and spending the night on floating kayaks. The thought of trying to sleep on an unstable platform with crocodiles about convinces me to continue on. In the last shimmering rays of light, by the grace of a higher power, we find the creek entrance along the shoreline, and we follow it for what seems like an eternity. We turn our headlamps on to full beam, but they still fade into darkness. The task of finding our night’s high ground seems increasingly hopeless. The ghostly voice of Alonzo Church, a member of an early Everglades exploration expedition in 1892, speaks in the back of my head “My advice is to urge every discontented man to take a trip through the Everglades,” he said. “– if it doesn’t kill him it will certainly cure him.” I don’t feel as though I am being cured, so I fear for the worst. At some point, after my body has become completely numb with cold and lack of circulation from paddling, the creek opens into a small bay. I squint into the darkness ready to give up and realize I am staring at the Indian mound. Built up years ago by the natives from shells, it is no more than a clearing among the mangroves the size of a small house, but it makes my heart swell up with emotions I can only equate to love. Perhaps Alonzo had a point after all. There is a reason the Everglades, despite repeated attempts, were never claimed and inhabited by U.S. citizens. The swampy water makes farming or colonization nearly impossible. Chickees, the somewhat rare sideless house-platforms rising from the water, were only adopted by the Seminole people during the Second and Third Seminole wars when they were driven from better lands into the heart of the Everglades by aggressive U.S. forces. In fact, it is a wonder even that plant life inhabits the Everglades. 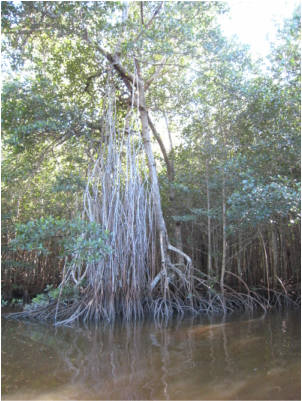 The dominant vegetation, the mangrove, is a tree like none other. Its twisting roots emerge from shallow saltwater to form a labyrinth that Daedalus could not have engineered. They converge like the tentacles of an octopus a foot or so above the mud on the thin trunk of the tree. Upward from this convergence, the tree is, well, a tree, but imagine growing your houseplant in a pot you filled with salty water twice a day. It would be lucky to live for an hour. Here in Florida, millions of trees spring out of the salty, oxygen-deprived soils. It is nothing short of miraculous. When the average American thinks of the Everglades, the mangrove tree is probably not what comes to mind. Certainly in much of the interior Everglades they are absent. But close to the Gulf, where the water begins to taste salty and the tides dominate, the water is stained red with the tannins of Rhizophora mangle: the red mangrove. Almost anywhere you see land in the tidal Everglades, you can bet it’s a mangrove island. They are the fundamental terrestrial structure of the region, and the mangrove is one of the only land-based plants around. In the Everglades, as in all ecological systems, everything is connected. Plants don’t just spring from thin air to fuel the rest of the creatures in the system. Critical nutrients like nitrogen and phosphorus have to be available to fuel new plant growth, and these resources are available because nature is the ultimate recycler. How does it work? Poop, my friend. Poop. Mangrove islands provide structure for herons, egrets, pelicans, kingfishers and all sorts of other birds to nest and take refuge in. In return, the birds poop on the islands, re-supplying the mangroves with the nutrients to grow and completing the cycle of life. As we fly down the Rogers River, the sleek shape of a monstrous primeval croc materializes out of the mud flats exposed by low tide. The spiked armored plates on its thick, muscular tail sparkle a dark green in the sunshine, and I can tell they pulse with energy despite the relaxed look in its eyes. I glance back at Collin and he nods. We paddle over cautiously, and I get my camera out without losing all tracking, a revolutionary accomplishment for me in this particular maneuver. I take a couple good shots and drift on. “I just floated in front of an 11-foot croc while sitting on an 11-foot kayak and survived,” I think to myself. Flipping through the pictures I have just taken, I am startled by the sound of a small tidal wave crashing back into still water. Impounded at the mouth of the river until the tide changes, Collin and I decide to rest in the sunshine and keep an eye on the landscape around us. Lying flat on my home-on-the-water, it is hard to imagine the Everglades as anything but wild. Gators and crocs lining the muddy banks, somehow spared the fate of so many other top predators now extinct at human hands, speak to the primeval order of the food web. As does the large fin of a bull shark that slowly surfaces as it makes its way out of the river before the tide traps it. Low billowing clouds of snowy egrets taking off from a tree at the mere sound of my paddle confirm that they too have natural enemies and thus must remain alert. The bull shark proves as much, as just befo­­re heading off into the Gulf it comes roaring from the water with a flash of jaws and fins leaving only white feathers floating where a wading egret once stood. The screech of a bald eagle as it flies low above me to intercept an osprey with a prized fish confirms that physical ability and lawless battles still govern the partitioning of limited resources. Even during the height of the Everglades tourist season, humans are temporary visitors that are not to remain. But the Everglades ecosystem, like every ecosystem on earth, is one that is altered by human behavior. The evidence of that alteration may not be as obvious as in other parts of the world, but it is certainly present. The changes made to this ecosystem generally are not direct. Instead, they come from far upstream and cascade down through the entire Everglades, altering the natural state of the swamp. The Everglades are a set of systems that revolve around water. During the summer when the skies turn dark and open up to pour rain every single day, an unfamiliar visitor would never guess he or she is located in the middle of one of the world’s 30° latitudinal desert belts. The land is literally shaped by water; in the freshwater marsh systems of the Everglades water flows slowly towards the ocean, shaping high-ground islands into water-carved tear-drops. But that much water isn’t good for crops or human development, and so the struggle to claim the Everglades for human well-being began with its first explorers from the New World. And failed. Again and again. The Spanish couldn’t colonize its native people, and the Americans who later gained rights to the land could neither colonize its people, nor drain all of its waters to make cropland, despite tremendous efforts. But even the unsuccessful efforts greatly affected the system: the natural diversity of creatures in the Everglades declined, the spatial heterogeneity of the system disappeared leaving one giant system that was all the same, and even the amount of organic carbon in the mud declined as a result of shifting microorganism communities. These changes shrunk the Everglades from the entirety of Southern Florida, starting near modern day Fort Lauderdale, to only the Southwestern quarter of the state, and development did not seem to be slowing. The Everglades needed a savior. And so one came. Just about the time Leopold spoke up for the land and Carson mourned the silence, Marjory Stoneman Douglas stepped up for the swamps by publishing The Everglades: River of Grass. “There are no other Everglades in the world,” she began, and in many ways, so Everglades conservation began. Years later, when the Miami-Dade County library moved locations, River of Grass was the last book to be transferred, carefully carried on foot by a runner as if holding a sacred torch. But the fight for the Everglades is far from over. In fact, the greatest challenges lay ahead – we must now continue to be stewards for this land even in the face of an exponentially growing human population. Our own welfare depends on it; this seemingly worthless land provides critical ‘ecosystem services’ like protecting against hurricanes and purifying polluted waters. The Everglades is a test, it’s been said, If we pass we may get to keep the planet. The next night, as we sit by the edge of Oyster Bay Chickee, Collin and I talk about the Everglades and cast lines, our hungry stomachs hoping for a treat we know is unlikely in the relatively cold weather. People will ask, we say, what’s it like to paddle the Everglades and the Wilderness Waterway? And we’ll tell them. Paddling the Everglades is getting caught by black storm clouds and wild winds that cause the waves to have whitecaps on the first day of your trip. Paddling the Everglades is considering what it would be like to sleep in the mangroves for a night when you get stuck in that storm. Paddling the Everglades is spending 15 minutes before bed swatting mosquitoes after taking approximately eight seconds to enter your tent. Paddling the Everglades is running the Nightmare, the legendary inland connection from the Northern Everglades to the Southern Everglades, smoothly at high tide. Paddling the Everglades is hearing an owl every night, and finally seeing it swoop low over Canepatch ground campsite as night falls. Paddling the Everglades is meeting companions at a chickee – in our case a crazy German couple paddling the 100-mile waterway in a 10-foot inflatable canoe with four-inch slats for seats, Google Earth images for maps, and approximately 500 bagels for food. Being Germans, they of course ask us in an accent if we would like lemons with our morning tea, as if it were preposterous that we wouldn’t have tea in the mornings. Paddling the Everglades is seeing a small shark finning in the shallows and investigating, only to find out when it is close enough to see its massive head that it is, in fact, not a small shark at all. It is quite large, and headed right for us. Suddenly, our idea session crashes to a halt as a jolt of energy dances on the end of my line, and I set the hook like I am swinging for the fences. After a small fight, I reel in a speckled trout, its silver flank dotted with black spots and accented with a rosy pink streak. Two fangs protruding from the fish’s mouth are the only teeth it has, and they seem out of place as I watch apathetically and hungrily as the creature begins to suffocate. Soon Collin catches another, and I decide I don’t want to wait to clean them until they die, so I slice a clean cut behind the fin and gills and continue along the spine of the fish, cracking through rib bones as I go. The result is a beautiful fillet, which I pull away from the slightly bloody carcass while separating the skin from the white flesh. After getting all the meat we can from the fish I greedily fire up the stove and cook the fillets in a small amount of olive oil that Collin and I have luxuriously brought. The white meat isn’t much, but something about our catch uplifts our hearts, and we thank the Everglades for surprising us when we thought we couldn’t be surprised. A loud gasp breaks the stillness of the night and startles me; whatever made the noise is directly behind my tent. On a tiny wooden island-platform rising up out of the middle of the bay, surrounded by over a million acres of swampy wilderness, I never expected to hear a human sound. Now rhythmic splashing reverberates in my ears with pounding urgency. Suddenly there is silence. Heart beating quickly now, I cautiously peer through the open rain-fly to find bay water so still that it mirrors every star in the sky. The near-full moon has just passed its zenith and makes the night glow a dark purple. The calm night stands in stark contrast to my racing mind… were the sounds real? We had seen a number of small planes earlier in the day – had they been searching for someone? For a split second I picture the aggressive gators that sometimes hang around the platforms, and I jump into action. My body struggles to free itself from an unruly sleeping bag with a broken zipper. I grab the closest sharp object I have – my flimsy 7-inch fillet knife –and step cautiously onto the platform and into the night. Outside the tent, I can see only the neon green blanket of stars, disappearing where it meets dark mangrove roots. I stand there, expecting a gator to roar from the water, but reality smoothly reasserts its dominance and brings me back to my senses. To my left a bulge of water rises like a small submarine surfacing. A plume of water sprays into the air, exposing the smooth head of a dolphin followed by its sleek body and jagged dorsal fin. Just as I can taste the salty mist, I again hear the human-like gasp for air before its next dive. 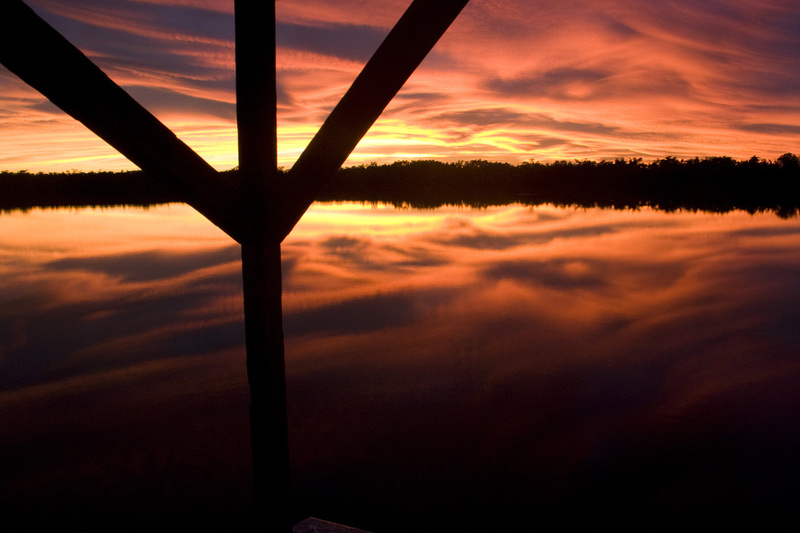 I lie awake thinking about the Everglades – both the natural beauty and the harsh features of the place. Stresses of modern human life dissolve here, and primitive stresses like finding food and a safe, warm place to sleep at night, crystallize. When the vast lights of Miami, visible on the distant Eastern horizon, fade at sunrise, I know it is time for us to load up and continue onwards. As we pull close to the town of Flamingo, starving and smelly, with long hair and beards unkempt, I regret that we must end our journey. Humans will never be more than visitors to the mighty and wild Everglades. A young park-goer, fresh out of the Visitor Center and looking for gators and other Everglades wildlife, catches a glimpse of us in our last moments before re-entering civilization. He turns to his father and pokes him with excited urgency. Turning back, he points to us, lifts a camera to his face, and snaps a picture. Perhaps even guests, no matter how transient, can become a part of a place. I’ll consider it fair exchange, for the 'glades certainly became a part of me.